Yes, solid iron, not plastic, can you believe it for this price. Built like a high cost knob, not the $2.00 range of some of the junk out there. This is one of two knobs in the collection with 3 handles. 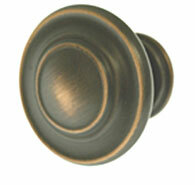 The venetian bronze is a hot color for many years now and still near the top. Product Details: (Product Number: 1253-1VB) Sale ends soon! Minimum quantity of 5 required.